Love is in the air! Celebrate the magic of love this Valentine’s Day. 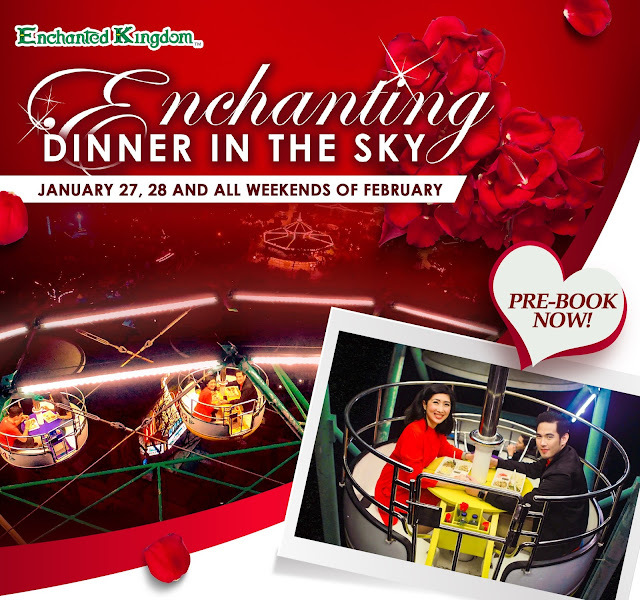 Enchanted Kingdom (EK) offers a twist to your usual Valentines date as it offers “Enchanting Dinner in the Sky”. The Couple package is P1,700 (P2,100 with Agila) and the group of four (4) package at P3,300 (P4,000 with Agila) inclusive of regular day passes, dinner on the Wheel of Fate, a souvenir photo, premier seats at the world-class Enchante Musical show. Pre-booked guests are also entitled to a 10% discount on Merchandise and selected stores. For inquiries and bookings, you may contact 0920 983 3624, 0999 884 8445, (02) 584 3535 and (02) 830 3535 or email personalmilestones@enchantedkingdom.ph. BOOK NOW!! Only LIMITED SLOTS available per day! Promo is only available on January 27, 28 and ALL weekends of February!